hornton striker Garry Thomson (left) scored his 17th goal of the season on Saturday. Stock pic. Hibs were first to threaten and Garry Thomson saw his shot from outside the penalty area slip narrowly past. Adam Drummond then had a long-range effort in the 11th minute that did not trouble Jack Shaw, but it was not to be long before Thornton took a deserved lead. Shaun Keatings crossed the ball back into the danger area after a corner and in the resulting action, Matthew Robertson headed the ball on and Roberto Morris could only divert the ball beyond Shaw for an own goal. The home side rarely threatened the Hibs’ defence but when Chris Liversedge was about to pull the trigger in the 19th minute after breaking clear, Matthew Robertson made a great recovery tackle to deny him. Hibs doubled their lead just after the half-hour mark from another Shaun Keatings’ corner. Adam Drummond’s header was blocked and when the ball broke to Stuart Drummond, he was tripped and referee Bell had no hesitation in pointing to the spot. Stuart Drummond took it himself and gave Shaw no chance as he blasted the ball into the net. 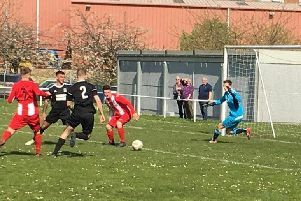 The victory was clinched in the 54th minute when Robertson capitalised on another Tayport defensive error to pass inside for Thomson to bury the ball from ten yards for his 17th goal of the season. Both sides were reduced to ten men after a spot of ‘handbags’ saw Tayport’s Gill and Thornton’s McNab depart to the changing rooms, although both players probably felt harshly dealt with. Goalkeeper Ryan Linton was called into serious action for the first time with two minutes remaining when he diverted a shot on the angle from Liversedge round the post to preserve his clean sheet. Tayport: Shaw, Morris, Paterson, Sturrock, Conway, Suttie, Christie, Chalmers, Robertson, Gill, Liversedge. Subs: Anderson, Mackie, O’Brien, Rennie. Thornton Hibs: Linton, Robertson, A.Drummond, S.Drummond, Hepburn, Orrock, Keatings, Coleman, Anthony, Thomson, McNab. Subs: Shields, Shanks, Adam, Crichton, Malcolm.